To personalise your event further spell out any message, name or age with our XL 3ft foil letter/number balloons for just £8.50 per balloon. See our balloon chart for more information. For additional treats and gifts for your guests see our range of personalised favours for more information. Tow tiered cake to your chosen bespoke design personalised to match your theme/age name. See our celebration cake gallery. 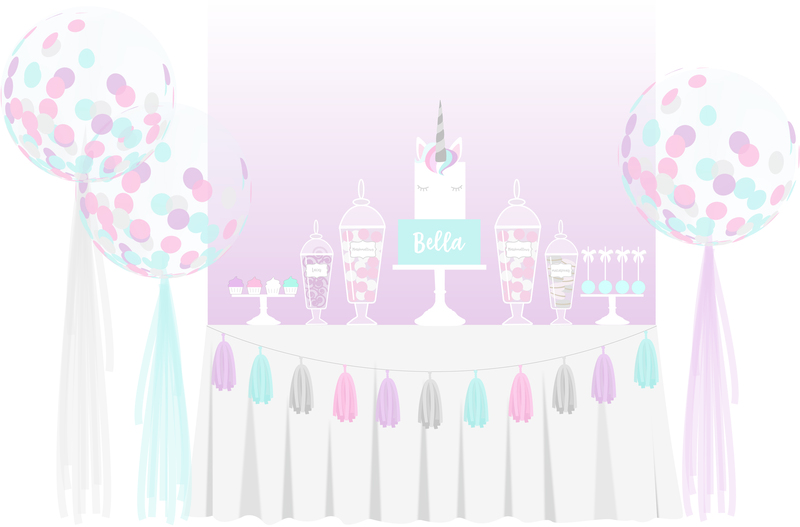 Unicorn buffet decorated with tablecloth, runner & hand made tassel garland. X2 Stands of custom bespoke cupcakes and cake pops. Check out cupcake gallery. Elegantly plated customised biscuits, personalised chocolates & sweet treats. View our candy buffet gallery. Decorative Large & medium sized bon bon jars filled with sweets & treats to match your theme. Antonia’s Candy buffets are decorated with personalised sweet labels/tags, ribbon detail and come with sweet scoops & treat bags. 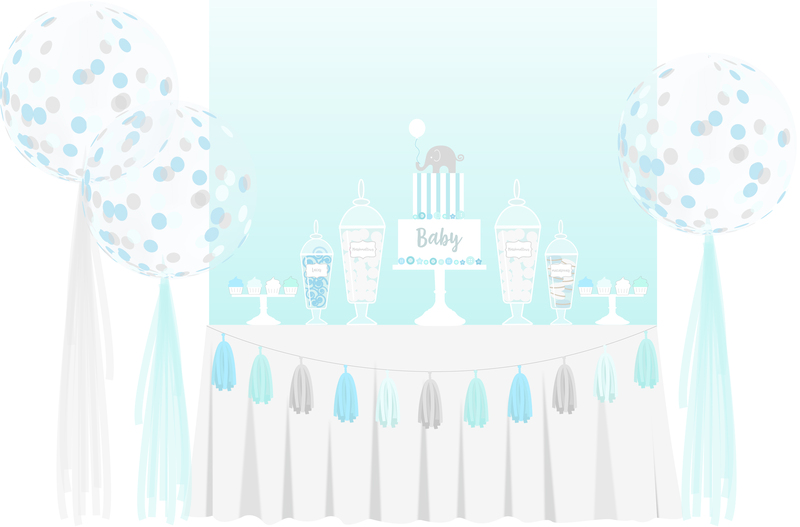 Our clear bubble balloons can be filled with fleathers or confetti & customised with a personal message or name. Ideal for christenings, baby showers and 1st birthday balloons! For a unique table centre to really wow your guests try our cupcake bouquets. Buttercream piped flowers arranged in a beautiful floral bouquet, perfect for holding your tabletop balloons. Three tier Minnie Mouse cake to a bespoke design, personalised with name/age. View our celebration cakes. X1 Cake table dressed with tablecloth, runner and hand made tissue paper tassel garland in Minnie colours. X2 Stands of Minnie Mouse cupcakes personalised with age/name. See our cupcake gallery. X6 Table top balloon bouquet clusters in Minnie Mouse colours. 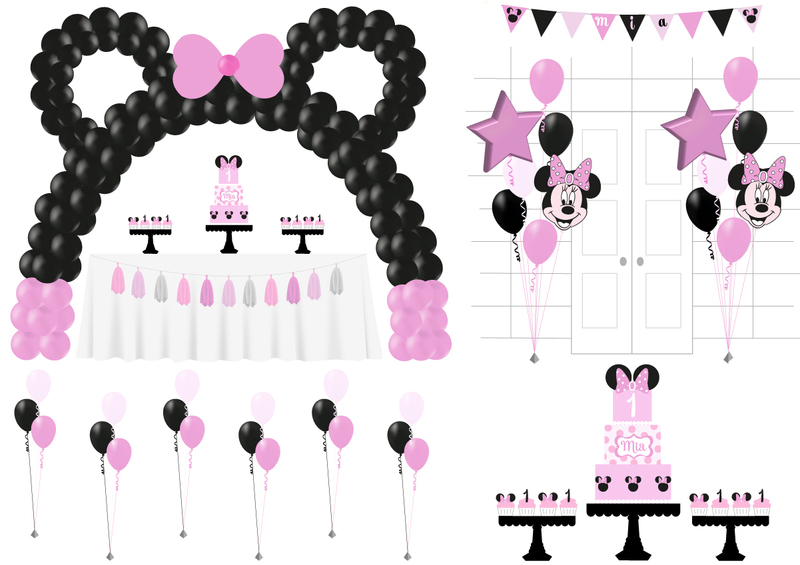 X1 Large balloons arch with Minnie Mouse mouse ears. X1 Personalised Minnie Mouse Birthday bunting with your name & age. X2 Large balloon bouquets with mixed foil, latex & character balloons. Ideal for party entraceway. Transform your Minnie Mouse cake table into a show stopping candy buffet. With jars and platters of sweets and treats in a beautifully detailed, personalised display. For examples see our candy buffet gallery. 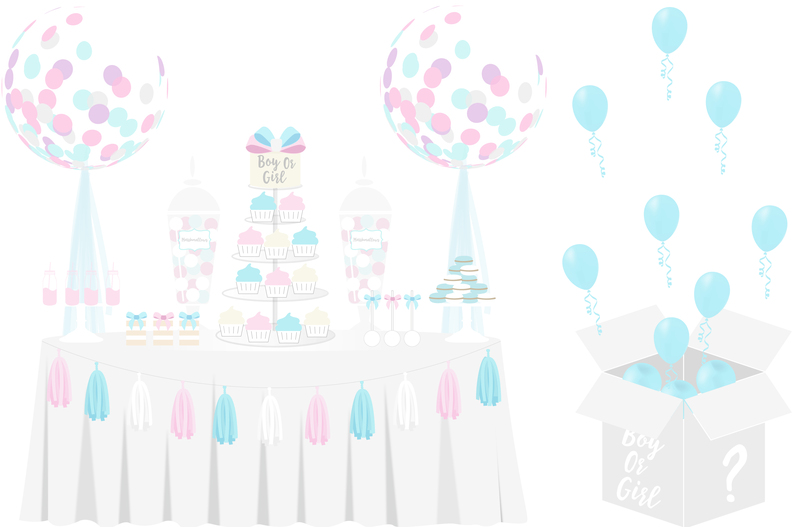 Our clear bubble balloons can be personalised with a message, name or age and filled with your choice of confetti or feathers. 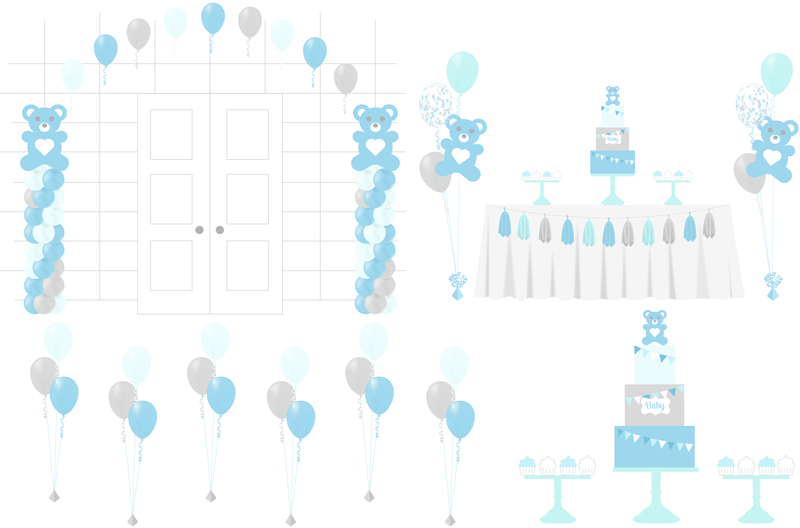 Perfect for baby showers, christening, and 1st birthday balloons.